TP-Link's Deco M9 Plus is a follow up to its Deco M5 I tested just over a year ago as part of the Wi-Fi System Roundup. Besides being slightly larger than its predecessor, the M9+ adds a second 5 GHz radio that can be used for dedicated backhaul. The third radio enables TP-Link to class the M9+ as AC2200 using maximum link rates of 400 Mbps on 2.4 GHz and 867 Mbps on both 5 GHz radios. As in the Deco M5, all radios are two-stream. 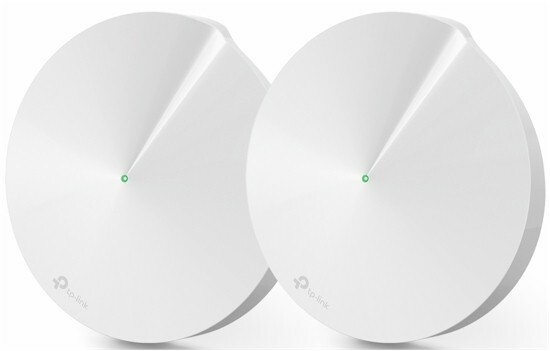 TP-Link is trying to differentiate Deco in the crowded mesh/Wi-Fi system market by loading it up with features, the most notable being its Trend Micro-based HomeCare's feature set that includes Parental Controls, QoS and Antivirus features. Bluetooth 4.1 and Zigbee/Thread radios plus IFTTT and Amazon Alexa support make the M9+ also capable of being a smart home hub. As noted above, the Deco M5 and M9+ share the same circular physical design and use a single multi-color LED to indicate status. However, the port complement is slightly different with the M9+ using separate power and USB 2.0 ports instead of the M5's USB-C port that doubles as a power port. USB functions are not supported, nor are there mounting slots on either product. The M9+ FCC docs are all posted, so I didn't open up the product for component identification. The internal shot below shows the view you'd see if you popped off the plastic enclosure top. That big heatsink plate is thermally coupled to the large, central RF can below it, which holds no key components. But thermal pads in the RF can top couple to the board to provide thermal relief for the IPQ4019 SoC, QCA8072 gigabit Ethernet switch and Nanya flash that sit below the area on the other side of the board. The product spec says there are 6 Wi-Fi, 1 ZigBee and 1 Bluetooth antennas. This means each radio gets its own antenna, all of which, except the Bluetooth's, are printed circuit boards vertically arrayed around the perimeter. Removing the heatsink and RF can tops reveals the high-band 5 GHz radios and most of the RF components for the 2.4 and 5 GHz low-band radios supplied by the Qualcomm IPQ4019 on the other side of the board. The Deco M5 board is shown below for comparison. We see a similar design approach, i.e. RF amplifiers and Bluetooth radio on this side. Note the antennas standing up from the board. The photo below shows the bottom side of the M9+ assembly, with the dual-layer heatsink pried apart. Once the heatsink and RF can top are removed, the Qualcomm IPQ4019, QCA8072 gigabit switch and Nanya flash memory are revealed. The same component trio sits under the M5's bottom-side RF can. The table below summarizes the Deco M9+ and M5's key components. I included the NETGEAR RBK40 Orbi ("mini") because its key components are very similar to the M9+'s.